Around 10,100 people are diagnosed with bladder cancer each year in the UK. It is the 10th most common cancer in the UK (not countring non-melanoma skin cancer). About 9 out of 10 bladder cancers in the UK are the transitional cell type. 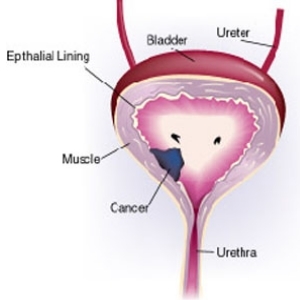 This is sometimes called urothelial cancer. Transitional cell bladder cancers can behave in different ways. There are early (superficial) cancers that have not invaded the deeper layers of the bladder and there are invasive cancers. Rarer types of bladde cancer include squamous cell bladder cancer (5 out of every 100), adenocacinoma of the bladder (between 1 and 2 out of every 100 people), sarcomas and small cell cancer of the bladder. The type and grade of bladder cancer can affect survival. Generally, for people diagnosed with bladder cancer in England and Wales more than 50 out of every 100 (more than 50%) survive their cancer for 5 years or more after they are diagnosed. Treatment options depend on the stage, type and grade of the bladder cancer. Treatment options include surgery, chemotherapy, radiotherapy etc. Research is curently interested in new way of treating bladder cancer or reducing side effects of the treatments that are already available. The table below lists the current open trials for bladder cancer coordinated by the Cambridge Cancer Trials Centre (last updated February 2018).